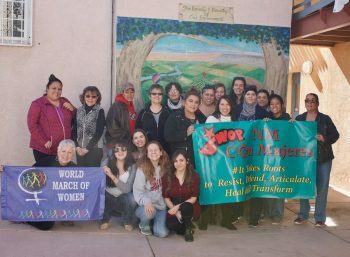 NM Con Mujeres is an intergenerational gender justice platform within the SouthWest Organizing Project, a 36 year old social and environmental justice organization. The mission of Con Mujeres is to not only expose the statistical and symptomatic affects of patriarchy, colonialism, and capitalism, but to look at these structures as roots of misogyny, feminization of poverty and the degradation of our mother earth. Traditional cultural wisdom and practices, education and healing circles, engaging voices and experiences of those most affected by violence and poverty, occupying public spaces, making elected officials accountable, building relationships with sister organizations statewide, nationally and internationally is how we resist unfair laws, defend our communities, articulate truths and facts, heal and respect ourselves – our communities and our planet to strategize, co create and build new and historic practices for peaceful and healthful forms of public coexistence.